Discussion in 'AMG Lounge' started by ecain63, Jun 2, 2016. Poll closed Jun 5, 2016. I am going to take a drive from Bournemouth to Balloch to see my folks this weekend. It's circa 480 miles and I did it in the pre-facelift C63 a couple of years back. The result was 34mpg average at 70mph and I did it on one complete tank........ just! That car was mapped (V4 about 520) and was a saloon PPP car on oem tyres. The current car is a facelift. Also a PPP saloon with a V5 map and a Remus exhaust circa 530bhp. The only negative is the tyres. Rears are 275 width MPSS so I'm expecting a little bit of extra drag over the oem 255 Conti 5Ps. My daily commute is around 22-23mpg at the moment and I do 15 miles each way. I'm not pennypinching at all so please don't tell me I have the wrong car if i want good economy. I'm simply playing a game between myself and the car. Writing simply yes or no and a little note as to why, do you think I'll do it on one tank? I assure you I'll only fill up if i run out / am looking at not making it and will start with a brim full tank of tesco momentum. I'll try to post regular updates too. I suppose it depends on if you want to make it or not. It's very easy for you to swing it either way with your right foot. Im hoping its going to be a simple cruise exercise. Traffic will be the killer but I'm hoping to get past Manchester before 5pm. If I do that then I'm hopeful of a successful mission. I've had better mpg from my c63 on long journeys than I have in my van!! Hope you prove the 63 isn't the gas guzzler everyone thinks. What time are you leaving ecain? Hopefully out of the office between 11 and 12. I had aimed for 10 but the missus has a chiropractor appointment at 9. I love a challenge like this. As i-Conica says, you're in control, if you really wanted to do it you should be able to. Risk areas... the acceleration away from the tollbooths on the M6 Toll (c'mon, we've all done it) and if the traffic is light on the M6 through the lakes it's tempting to push a bit there. I was going to be really very cheeky and ask for a lift to the North West actually, I am about to buy an E63 in Lancashire. I have that sorted now though. I think you are probably best leaving mid-morning to make it, roads will start getting busy after 3pm IMHO, people leaving work early for the weekend. I am going to vote for 'you will make it' all the same! Ha! I'd have taken you as far north as Glasgow. If you're sorted then cool. I wish you all the luck in the world, but living in the Northwest as I do, I know it's horrible on Friday afternoons up here until you get past Preston. This is true. Luck is definitely what I need. If i was betting, I would say you wouldn't make it with one tank of fuel. How in the world did you manage more than 30mpg in the past?? When I picked up my car, I drove from Derby to Aberdeen and still only managed mid 20mpg. I pretty much stuck to the speed limit all the way as well. 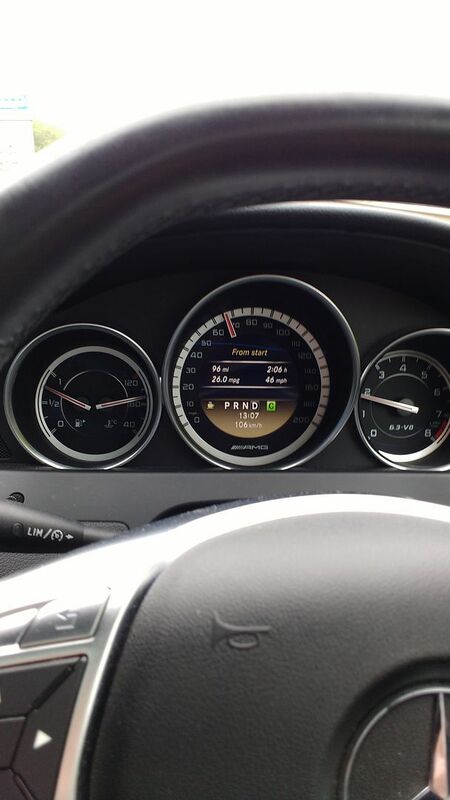 480 miles on one tank in a c63, hard to believe. You'll have to be lucky and be very restrained for the whole trip. I'll be keen to know how far below zero you can get the Tank Range indicator though ! In one long non-stop run in light traffic and actively trying to be frugal, then I think you'll scrape it just but will have to brave out the low level fuel light. You can ignore that for another 30 miles on a motorway. If you start treating the throttle as if hasn't got one of your own testicles under it, you'll fail. Yes - Because I like an underdog! !